Display a Potted Plant or Use Them for Storage! Bring a bit of the garden inside with a pretty hanging fabric wall planter. This is a lovely idea for chasing away winter blues and welcoming spring. Or change the pot of flowers for display later in the season. The baskets will also be charming for storage, perhaps hanging near the entry or elsewhere around the house. You can display other things, as well, like silk flowers or a small house plant. Or, omit the hanging loop on the back and use them as Easter baskets. You can also fill one with goodies for a gift any time of the year. Just change the fabric to suit the occasion. Sized for a 4″ pot, tuck a sturdy plastic bag inside so the basket isn’t damaged by moisture. Choose a pretty combination of fabrics from your stash. The baskets are stiffened with Heat-n-Bond® Craft Extra Firm Fusible Interfacing along with Heat-n-Bond® Fusible Medium Weight Interfacing (click the links to buy). The tutorial is by Carla Henton, writing for Therm-o-web. 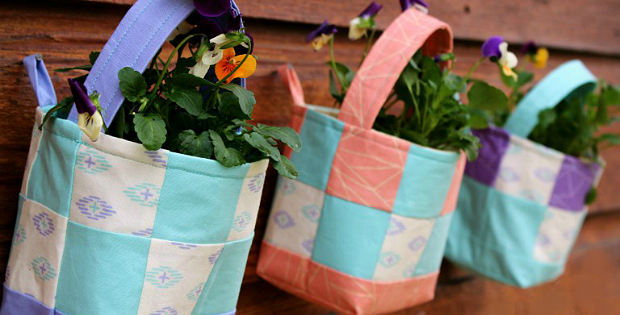 Click here for the free “Fabric Easter Basket Wall Planter” tutorial.